Petra is a fascinating ancient city and was selected as one of the New Seven Wonders of the World. 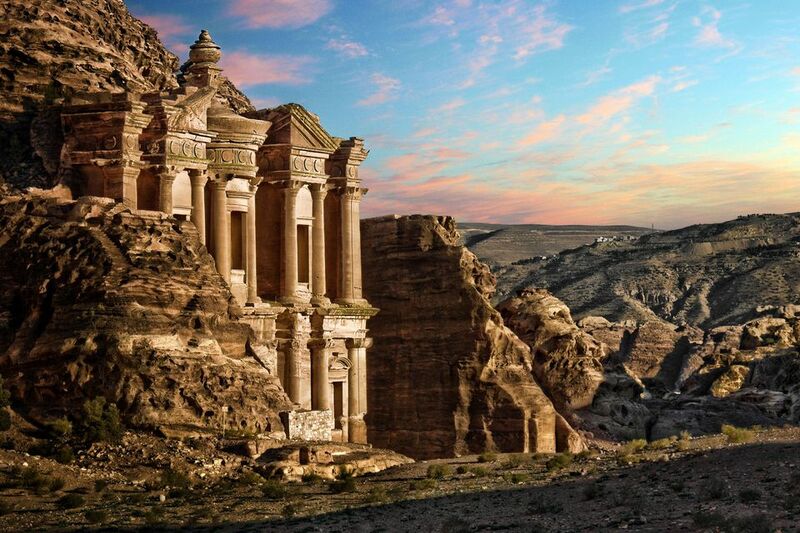 Lying in a remote area of the southern desert mountains of Jordan, Petra was "lost" to the western world from about the 14th century until the early 19th century. The rose-red city carved into the limestone mountains was prominently featured in the climax of the Harrison Ford/Sean Connery movie, Indiana Jones and the Lost Crusade. Aqaba, Jordan, which is about a 2.5-hour drive from Petra, is a popular Red Sea port of call for cruise ships sailing between the Mediterranean and the Far East. We visited Aqaba for two days on the Silversea Silver Whisper, which allowed us time to spend a day in Petra and a 1/2 day on a 4-wheel drive excursion into the desert at Wadi Rum. These pictures from Petra capture both the beauty and the mystery of this ancient city carved into red cliffs. Petra is definitely a "must see" for Red Sea and Southwest Asia cruises. Continue to 2 of 35 below. The 2.5-hour-drive from Aqaba to Petra is filled with desert scenes such as this one. Continue to 3 of 35 below. We saw several sheep herders with their flocks of sheep on the way from Aqaba to Petra. Continue to 4 of 35 below. Wadi Musa (Valley of Moses) is a small village that sits at the entrance to the ancient city of Petra. Wadi Musa has hotels, restaurants and tourist amenities. Continue to 5 of 35 below. The walk into Petra from the entrance near the Movenpick Hotel in is a gradual downhill. Most people enter Petra, the ancient city of the Nabateans, on foot or horseback. The walk down into Petra is fairly easy. Take your time and carefully look at all the sights in the rocks along the way. It is about 800 meters (1/2 mile) to one of the most well-known sights--the Siq. Continue to 6 of 35 below. Some people rent horses at the main entrance to ride down into the city of Petra. The horses looked well-maintained and feisty. Continue to 7 of 35 below. Petra has over 800 registered archaeological sites, of which over 500 are tombs. The Nabateans lived in tents (like the Bedouins), but buried their dead in ornate tombs carved into the limestone rocks of the valley. Most of what remains are the tombs. Continue to 8 of 35 below. As you continue walking down into the ancient city of Petra, the cliffs start to get higher, and the path starts to get narrower. Continue to 9 of 35 below. Carriages are also available to ride from the entrance of Petra to the Treasury. We paid $25 to ride one way -- out of Petra and back up the hill. Continue to 10 of 35 below. Riding in a horse and carriage sounds like a slow and easy way to leave Petra. However, the buggy drivers make the horses run as fast as possible since it is a fixed fee back to the Petra entrance. The ride can be wild and rough since the road is very bumpy in places. We laughed all the way back from the Treasury in Petra, but it certainly was not a slow and easy ride. Some of the carriage horses were feisty and beautiful like the riding horses we saw. Others appeared to be very well worn and only one step away from the glue factory. It was sad to see these horses making the rough, almost mile-long ride between the Treasury and the entrance to Petra. Continue to 11 of 35 below. This Petra tomb was built by the Nabateans in the 1st century BC. The most intriguing part of this structure is the interesting mixture of Egyptian, Greek, and Nabatean-styled architecture. Continue to 12 of 35 below. After walking for about a half-mile, visitors to Petra reach the entrance to the Siq, the ancient main entrance to Peta. After slowly walking for about 30 minutes, we reached the narrow entrance to the ancient city of Petra, called the Siq. We expected Petra to be more reddish than it was, but according to our guide, the colors come out more when it rains. Continue to 13 of 35 below. The Siq is about 1200 meters (3/4 mile) long and is a narrow gorge of stunning beauty. The geological formations, amazing rock colorations, and narrow passageways are surrounded by cliffs that tower almost 300 feet overhead. This part of Petra is what I remember from the Indiana Jones movie, and I could almost see Harrison Ford and Sean Connery riding towards us away from the Treasury. Continue to 14 of 35 below. The Siq is very narrow and was an excellent protective entrance to Petra. In some places, the passageway is less than 7 feet wide. Continue to 15 of 35 below. Walking the 1.2 kilometer (3/4 mile) trail through the Siq into the center of Petra is a walk back into time. Carvings such as this one can be seen along the walls. Continue to 16 of 35 below. The Siq is very quiet, and you can almost imagine the ancient caravan drivers arriving into the city on the same route. Continue to 17 of 35 below. Another carving in the wall of the Siq at Petra--this one of a man. Continue to 18 of 35 below. These donkeys look too small to carry an adult, but donkeys are used by many to get around in Petra. Prices can be negotiated all around Petra. Donkeys always remind me of the Grand Canyon, and I imagine riding a donkey on the steep trails around Petra would be just as harrowing as in the Grand Canyon. Continue to 19 of 35 below. As the trail snaked through the narrow Siq, we all kept watching for a glimpse of the magnificent Treasury. Can you see it ahead? Continue to 20 of 35 below. The Treasury is the centerpiece of Petra and the most beautiful monument in the ancient city. Emerging from the Sik, the 1.2 km narrow passageway through the colorful rocky cliffs of Petra, to come upon the magnificent Treasury, is a magical moment for most visitors to Petra. Carved into the sandstone cliff in the 1st century BC, Petra's Treasury was originally a tomb but was later used as a temple. The architecture of the Treasury (Al-Khazneh) is particularly interesting and is a mixture of Greek, Egyptian, Roman, and Nabatean elements. The Treasury is 30 meters wide and 43 meters high (98 feet by 140 feet) and is tucked into a corner of the wide canyon at the end of the Siq. As with most of the other monuments at Petra, the interior of the Treasury is unadorned and barren. Continue to 21 of 35 below. Continue to 22 of 35 below. There is no money inside the Treasury at Petra for the guards to watch over. They are protecting the Treasury from vandals. Continue to 23 of 35 below. Archaeologists have made an interesting discovery under the steps of the Treasury at Petra. They have found more levels underneath the building and now believe that what we can now see may be the top floor of at least three floors! Continue to 24 of 35 below. The inside of the Treasury at Petra is barren, with two unadorned rooms with high ceilings. Continue to 25 of 35 below. Continue to 26 of 35 below. Continue to 27 of 35 below. The tombs on the street of facades are built into the hillside. It is believed that the Nabateans lived in tents and were buried in the hills. Continue to 28 of 35 below. Every tourist site has a great photo op location, and this small window in one of the Nabatean tombs was perfect. Note the wonderful sandstone colors. Continue to 29 of 35 below. This outdoor rock theater was carved and built over 2000 years ago by the Nabateans. The original Petra theater was very elaborate, with multiple entrances and 45 rows of seats. The earthquake in 363 AD badly damaged the theater, but its magnificence is still apparent. Continue to 30 of 35 below. Continue to 31 of 35 below. Camels are used mostly at Petra for quick photographs, but not for tourist transportation. We saw several near the theater. Continue to 32 of 35 below. Continue to 33 of 35 below. Continue to 34 of 35 below. After walking around Petra and gazing at all of the remarkable sites in the ancient city, our Silversea Silver Whisper shore excursion featured a delicious buffet lunch at the Movenpick Hotel in Wadi Musa. After lunch, we boarded the coaches for the 2.5-hour ride back to Aqaba and the Silver Whisper. Our expectations were very high for Petra, and the old city did not disappoint. Continue to 35 of 35 below. On the drive back to the Silver Whisper after our day at Petra, our coach stopped for a view of the mountains surrounding Petra. The area is huge! Nature's Mysteries: Why Do Flamingos Stand on One Leg? Beignets, Voodoo, and Jazz in This One-Day French Quarter Itinerary.